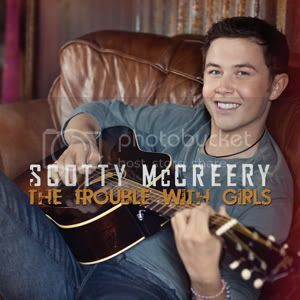 ScottyMania Takes Over TV: McCreery Makes TV Rounds, Performs Single "The Trouble With Girls"
As Scotty McCreery’s star ascends, so does his debut album Clear As Day; released this week it’s sitting pretty at the No. 1 spot on iTunes, Amazon, and projected to make it a perfect trifecta with a No. 1 on the Billboard 200 album chart as well. This would make young Scotty the first American Idol winner since Ruben Studdard to have their debut album come in at the top spot during its first week (Ruben’s debut album, Soulful, entered the top 200 at No. 1 in 2003). I reviewed Clear As Day earlier this week and even though I have been championing this kid since I saw him audition for American Idol in Milwaukee last year (in case you live under a rock or are Amish, he was the eventual winner), I have to say I was pleasantly surprised by the album as a whole. As a dutiful artist, Scotty’s been making the rounds this week to promote the debut album and without even trying, I’ve caught him on The Today Show, The Tonight Show, and Regis and Kelly performing his current singl “The Trouble With Girls.” As BlindedBySound’s resident Idol expert (I think that was self-dubbed, by the way) I made it my job to watch all three performances and came up with a couple conclusions. First of all, Scotty sounds better and looks more confident than even on his best night of Idol. Guess that comes with having won and being just shy of 18 years-old with that “I can conquer the world” mentality still fully intact. He performs wiith the swagger and apparent joy of both a seasoned veteran and bright-eyed new kid on the country block. He also no longer holds the mic in that goofy “making a call with a banana” way, and despite his bad hair looked so poised and self-assured. I'm very proud of this kid and there are many more announcements and performances in Scotty McCreery’s future. Check back here often for the latest.